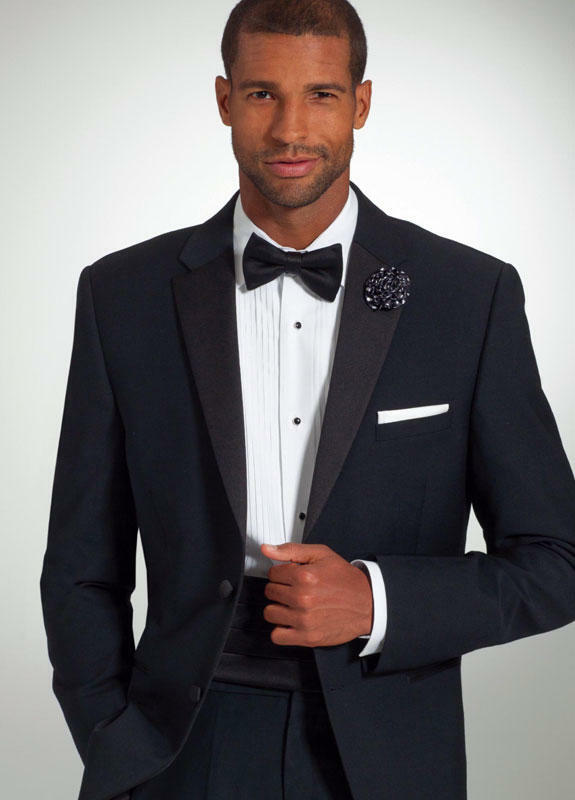 Welcome to the new tuxedo department at Castle Couture: Tuxedos for the groom, tuxedos for the groomsmen, tuxedos for prom, and formal wear suits for men for any special occasion, including the wedding party and guests! Our tuxedo department can offer you the whole package: not just the jacket and pants for the tuxedo or suit, but the vest, shirt, and the tie and cummerbund in your special colors. You will be able to chose from more than 50 styles and will be professionally measured to ensure a perfect fit for your big day. You can rely on Castle Couture to provide you with the top men's formal wear designers and cover a wide range of price points. You will find designers such as Allure Men, Michael Kors, IKE Behar, Savvi, and Erik Lawrence, to name a few. It's not only the bride who may choose to change into a new outfit just for the reception: More and more grooms are opting for a special reception coat. 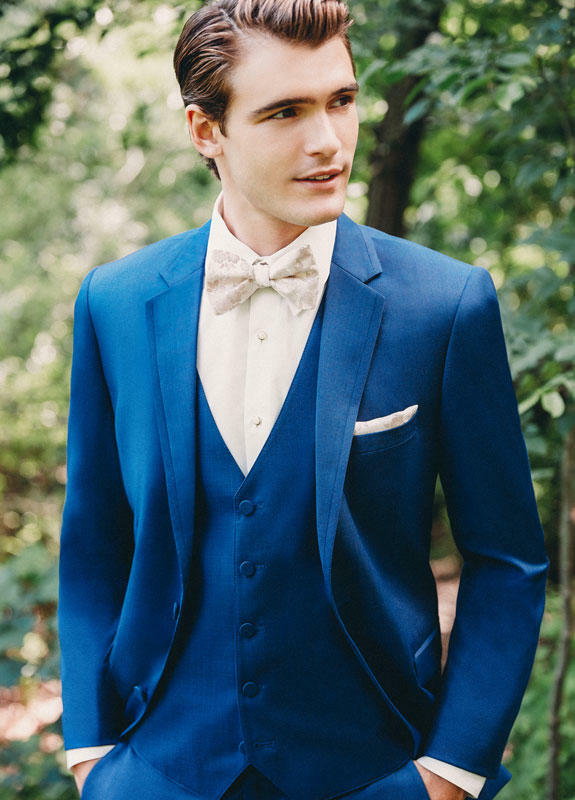 We have many styles designed to coordinate with your wedding tuxedo or suit. Please look below for a list of our most frequently asked questions about our men's and boys' tuxedos and formal wear suits. DO YOU HAVE TUXEDO AND FORMAL SUIT ACCESSORIES? We have almost everything you could need to complete your ensemble: From socks to suspenders, ties and cummerbunds, canes and gloves, cuff links and lapel pins, and and even formal hats, you can find all of your accessories in one place. DO YOU HAVE RENTAL SHOES? Yes, you may rent shoes that complete your formal wear look for a small, additional fee. HOW MANY COLORS DO YOU HAVE FOR TIES, VESTS, AND CUMMERBUNDS? Too many to count! Mix and match colors and patterns to let your personal style show! DO YOU HAVE TUXEDOS OR SUITS TO FIT YOUNGER BOYS? Yes, we do! Whether you need something special for the ring bearer, a young wedding guest, a Communion, or a Bar Mitzvah, we will help you find the perfect suit for him. We have a generous range of pricing based on the category, from classic (our lowest priced option), fashion, and luxury, to our ultra luxury category (our premium collections). Although many items are available in as little as a week, we recommend booking your tuxedo or suit at least a month in advance to ensure you get the style and colors you want. DO YOU HAVE SIZES THAT WILL FIT ME? Yes! Since everything is measured and ordered separately, we can accommodate nearly any size. We even carry extra long and odd sizes. CAN I BUY MY SUIT? Yes, we have select suits - for both men and boys - that are available for purchase. Please ask your stylist for details.